Today I want to focus on the early life of one of the greatest nineteenth century French landscape painters, Jean-Baptiste-Camille Corot. He was one of the leaders of the Barbizon School and a master of plein air painting. The Barbizon school, which existed between 1830 and 1870, acquired its name from the French village of Barbizon, which is situated close to the Fontainebleau Forest. It was here that an informal group of French landscape painters gathered. Other great luminaries from this group were Théodore Rousseau, Jean-François Millet, Charles-François Daubigny and Constant Troyon, to mention but a few. Corot was born in Paris in 1796. He was one of three children. He had an older sister Annette Octavie and a younger sister Victoire Anne. His father, Louis Jacques Corot, a Burgundian, was a cloth merchant and his mother, of Swiss origin, Marie Françoise Corot née Oberson, came from a wealthy wine merchant family of Versailles. Camille’s parents were members of the so called bourgeois class, characterized by their sound financial status and their related culture, which their money allowed them to enjoy. Following their marriage his father managed to purchase the hat shop, which his mother had worked in and he then gave up his career and helped her manage the business side of the shop whilst she carried on with her design work. The family lived over the shop, which was situated on the fashionable corner of Rue du Bac and Quai Voltaire, at the end of the Pont Royal Bridge. From the windows of his room above the shop, Corot was able to see the Louvre and the Tuileries. It could well be that the beautiful views Corot witnessed from his room had an influence on his art. Their shop was very popular with the Parisians who always wanted to have the latest in fashion accessories. It was a very successful business venture and on account of his parents’ affluence, Corot, unlike many of his contemporaries, never had to endure the hardships brought about by poverty. Corot left Rouen and the Sennegon family home and, at the age of nineteen, he completed his formal education at a boarding school in Poissy, near Paris,. Corot was not remembered as a clever student. He never won any academic awards and did not show any interest or ability in art. After leaving college his father arranged a number of apprenticeships for his son with a number of cloth merchants but Camille never settled and disliked the business practices inherent in that line of work. Corot had discovered another love which soon consumed him and his time – Art. In 1817, Corot started to spend all of his evenings painting, attending the art school, Académie Suisse in Paris. The one thing that Camille did gain from working with textiles at the cloth merchants was it taught him about colours, patterns, textures and design and it could be that it was then that he began to explore painting as a possible career. His father had equally had enough of his son carping about working for fabric dealers and so asked him that if he wasn’t to follow him in his trade then what did he want to do. Camille’s answer was unequivocal – he wanted to be an artist. However, to do this, Camille needed some extra financial help. Sadly, a year earlier, his younger sister, Victoire-Anne, had died and her annual family’s allowance of 1500 francs could now be made available to finance Camille’s artistic ambitions. This modest funding was to support Camille comfortably for the remainder of his life. His parents were not happy with their son’s decision to become an artist, believing life as such led to just one thing – poverty. With the financial assistance from his parents, Corot established an artist’s studio at No. 15 Quai Voltaire, a road which ran along the banks of the River Seine and was located close to his family home. He, like many aspiring artists of the time, studied the works of the Masters in the Louvre and was initially tutored by the French painter, Achille-Etna Michallon. After the passing of Michallon, in 1822, Corot moved on to the studio of the French historical landscape painter, Jean-Victor Bertin. It was under the auspices of this painter that Corot started combining the French neoclassical with the English and Dutch schools of realistic landscape art in his paintings. Corot at the same time began sketching nature en plein air in the forest of Fontainebleau near Paris and in Rouen. In 1825 Corot decided that to enhance his artistic ambitions he had to follow the well trodden route of artists and head for Italy. Here he wanted to study the landscape of the Italian countryside around Rome, the Campagna. 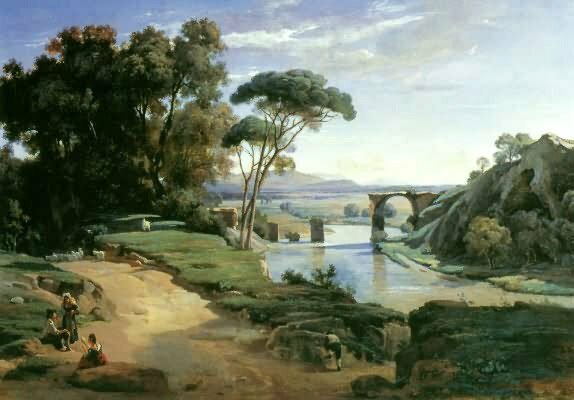 He remained in the area for almost three years and in 1826 he took a painting trip to the Nar Valley and the hill top town of Narni which brings me to My Daily Art Display’s featured paintings by Corot entitled View at Narni, which is currently housed in the National Gallery of Canada in Ottawa and the preliminary oil sketch, The Bridge at Narni, which can now be seen in the Louvre. This was initially painted by him as a study for that final work. Painters in France at the time were encouraged to paint outdoors (en plein air) but the results were not looked upon as the finished works but merely as aides-mémoire for how the light and the atmosphere was at the time. The artists would then take these sketches to their studios where he or she would complete the finished Classically-balanced composition. The preliminary sketches were then just filed away and were never exhibited. Now of course, these plein air sketches are very valuable and of great significance as they highlight the immediate and unmediated perception of the scene as seen through the eyes of the artist. It is therefore interesting to look at the differences between the preliminary topographically true vision of a landscape and the finished work which may in some way have been somewhat idealized in order to boost the artist’s chance of selling the painting. Today I am featuring both Corot’s preliminary sketch and the completed painting depicting the Bridge at Narni. He came upon the town of Narni, on the River Nera in September 1826. This Roman Bridge of Augustus was built in 27 BC, and was one of the two tallest road bridges ever built by the Romans. 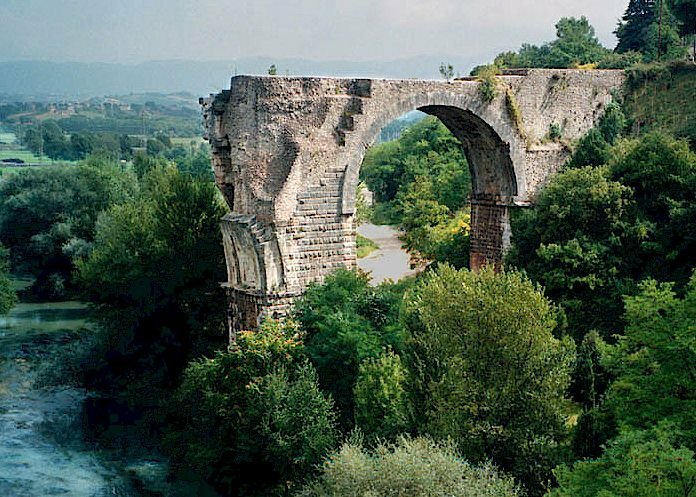 The Narni Roman Bridge was 160 m long and its remaining arch is 30 m high. 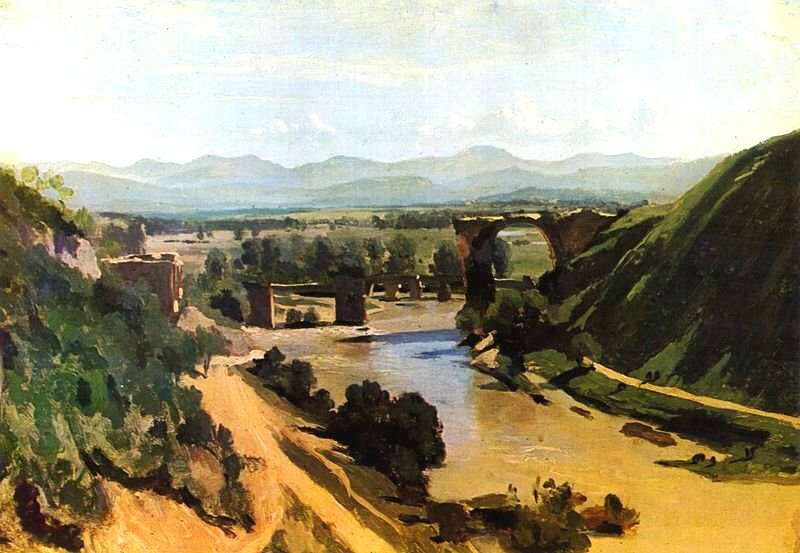 Corot was not the first artist to incorporate the bridge in one of his paintings as his erstwhile tutors, Achille-Etna Michallon and Edouard Bertin both completed works which depicted the structure. If we look at the preliminary oil sketch above we can tell it is a first attempt as the foreground is formless in detail. Maybe this is due to the fact that as a plein air artist he was not concentrating on the details close to where he stood or sat at his easel. His concentration would be solely focused on what he saw in the mid-ground and the background and he would have been absorbed by the aspects of light and shade at the very time he was putting brush to canvas. This sketch of Corot’s was highly acclaimed by artists and critics alike for its naturalness and for its captivating breadth of vision. When Corot returned to Paris the following year he set to work on his final oil painting of the bridge at Narnia. He decided to put forward two paintings for exhibiting at the 1827 Paris Salon. He wanted them to be two contrasting works. One would depict a morning landscape whilst the other would depict an evening landscape. For the morning landscape he submitted his final View at Narnia, the one shown at the start of this blog, whilst putting forward The Roman Campagna (La Carvara) as the evening landscape scene. This latter painting is presently housed in the Kunsthaus, Zurich. This final rendition of the painting, View at Narni, is much larger, at 68cm x 93cm than his preliminary oil sketch, Bridge at Narni, which only measures 34cms x 48cms. When Corot set about “transferring” the details from his preliminary sketch on to the canvas for his final version he had to tread a fine line when it came to topographical integrity and idealised perfection. This was the normal practice of landscape artists of Corot’s day. It was expected of the landscape painter not to just depict a photo-like depiction of a scene, but bring to the painting what the likes of Claude had done before – a neoclassical ennoblement. The artist had to bring an academic approach to bear on his initial vision. Look how Corot has changed the foreground from being a steep slope in his preliminary sketch, which was how it was, to terracing and as was often the case in academic landscape works he has added a path, in the left foreground, and on it we see some sheep and goats. Corot has added shepherds tending their flock and near to the cliff edge, he has added a couple of umbrella pine trees synonymous with and symbolic of the Roman countryside. This final version has now become a typical example of a Neoclassical landscape. I will leave you to decide whether you prefer the original, topographically accurate sketch or the somewhat idealized final version. Below is how the bridge appears today. In my last blog I looked at an altarpiece by Michael Pacher and discussed terms such as diptych, triptych and polyptych, which all referred to panel paintings which were hinged together. Although we looked at a triptych altarpiece this form of art was not only used in the depiction of religious personages. There were many commissions for the diptych when it came to secular portraiture. Often it would be the portrait of the husband on one panel with the portrait of his wife on the other. The diptych was quite a common format in the Early Netherlandish paintings of the 15th and 16th centuries. In my blog today I want to look at a fifteenth century diptych, known as the Melun Diptych, which was the work of the great French painter and manuscript illustrator, Jean Fouquet. Although the attached photograph above shows the two paintings as a diptych, the two panels are now separated. Up until 1775, the diptych remained in the church of Notre Dame in Melun. However the church fell on hard times and needed money to help pay for the building’s restoration. The elders of the church decided to raise funds for the building work by selling the diptych. The right wing with the Madonna and Child was sold to the mayor of Antwerp and it has remained in the Belgian city ever since. It is now housed in Koninklijk Museum voor Schone Kunsten, Antwerp (The Royal Museum of Fine Arts). The left hand panel of Chevalier and St Stephen was purchased by Clemens Brentano, the German poet and novelist in 1896. This panel is now housed in Staatliche Museen, Berlin. Each of the wood panels measure 93cms x 85cms. 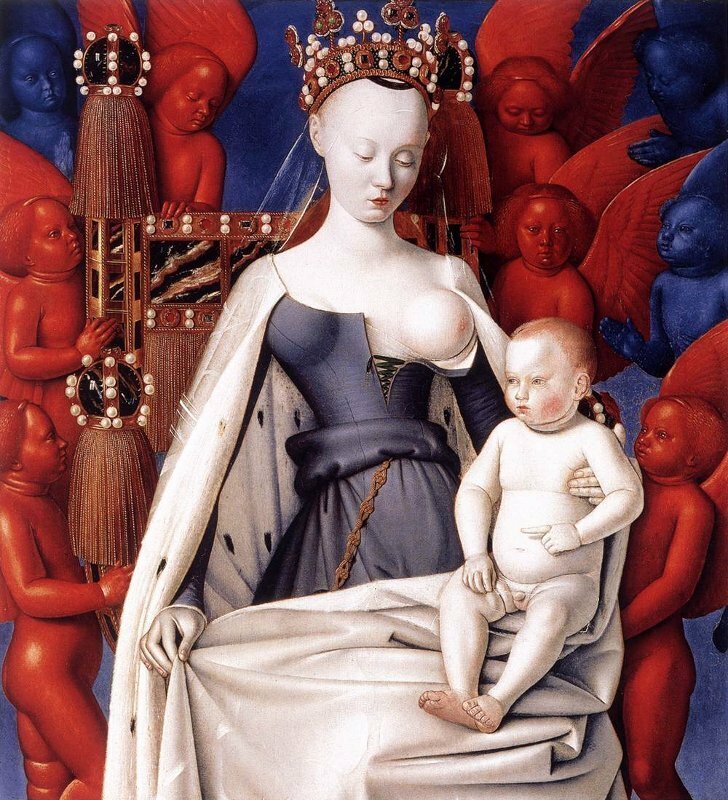 Jean Fouquet was born in Tours, a town in the Loire Valley, around 1420. It is thought that Fouquet’s initial artistic training was at a studio in Paris, where he was educated in the ways of a manuscript illuminator and painting of miniatures. It is also believed that he may have worked as an apprentice in the Bourges workshops of the Netherlandish painter, Jacob de Littemont, who was the court painter to Charles VII and later, Louis XI, a position that Fouquet himself would hold in 1475. His first recorded painting dates back to 1440, and was entitled The Court Jester Gonella, who was the court jester of Nicholas III d’Este. I featured that painting in My Daily Art Display of December 14th 2010. In 1445 he completed one of his first very large panel portraits entitled Portrait of King Charles VII. It was the portrait of the French ruler, Charles VII. The king is painted between drawn curtains. The artist has painted the king in three-quarters profile and the inscription on the frame “le trés victorieux roy de France” reminded everybody that this was the ruler who brought the Hundred Years’ War to a triumphant end. Ironically it was one of the few battlefield victories achieved by the ruler. When Fouquet returned to France in 1448, he opened a workshop in Tours and married. He worked for the French court and carried out commissions for King Charles VII, the king’s treasurer Etienne Chevalier, and the king’s chancellor Guillaume Jouvenel des Ursins. A number of these commissions were miniatures, such as the Book of Hours of Étienne Chevalier. 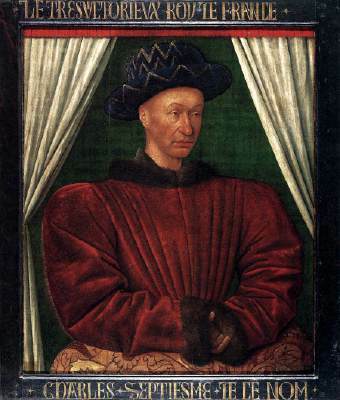 In 1475, Jean Fouquet became the court painter to Louis XI. Fouquet died in Tours in November 1481. My Daily Art Display featured painting today is the Melun Diptych, so named as its original resting place was the cathedral at Melun, a town in the south-eastern suburbs of Paris. This was a commission Fouquet received from Etienne Chevalier. Estienne Chevalier came from Melun and worked for the government. His initial posting was as French Ambassador to England in 1445. Six years later he became Treasurer to Charles VII of France. Once Fouquet had completed the diptych, Chevalier presented it to his home town. The diptych was made to be placed above the tomb of Chevalier’s wife, Catharine Bude, in the Collegiate Church of Notre-Dame, in Melun. As I said in my introduction the diptych doesn’t exist anymore as a hinged pair and sadly, another thing we cannot see is the original framing. According to a description of the paintings by Denis Godefroy, a seventeenth century historian, the original frames were covered in blue velvet. Around each picture were strands of gold and silver thread, in which the donor’s initials were woven in pearls. There were also gilded medallions on which stories of the saints were represented. Let us first look at the left hand panel of the diptych. 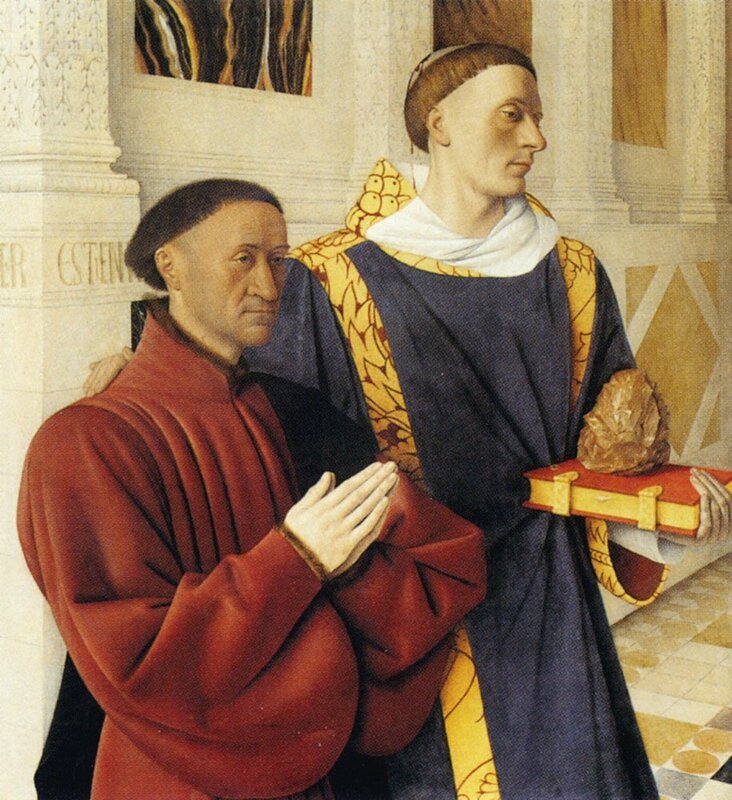 On the left wing of the diptych, Etienne Chevalier had himself painted next to his patron saint, Stephen (“Etienne” when translated into the English language is “Stephen). Chevalier kneels in a red robe with his hands clasped in prayer. The red colour of the robe indicates the status of Chevalier as it was the most expensive coloured dye and was reserved for high-ranking magistrates. Next to him we have Saint Stephen wearing the dark robes of a deacon with its gold trim. Stephen’s right arm is draped around the shoulders of Etienne Chevalier in a protective manner. In the left hand of the saint there is a book, on which a jagged stone is lying. This symbolises his martyrdom (St Stephen was stoned to death). The background consists of Italian Renaissance style architecture with pilasters, in between which are inlaid marble panels. The floor is made of neutral coloured tiles, which allows a glaring contrast with the highly coloured clothing of then two figures. On the wall, receding in perspective, the name of Estienne Chevalier (IER ESTIEN ) is inscribed. The two men look to their left at the Madonna and Child, who is portrayed on the right wing of the diptych and in some way if we look at the two panel paintings of the diptych together, it appears that St Stephen is introducing Etienne Chevalier to the Madonna and Child. The plunging perspective Fouquet has used in this painting has in some way moved the two characters closer to us and they dominate the work. Now let us look at the right hand wing of the diptych, which is entitled Madonna and Child. The first thing that strikes the observer is the strange and vibrant colouring used in the painting. The unnatural colours have been attributed to represent the heraldic colours of the French king, being red, white, and blue. It is generally agreed by art historians that the features of the Madonna are those of Agnès Sorel. She was a favourite mistress of Charles VII and bore him three daughters. She was known by the nickname, Dame de beauté. In 1450, Charles was away on a campaign at Jumièges. Agnès Sorel was at her home in Chinon, which the king had provided for her, but she wanted to be with Charles to give him some moral support. 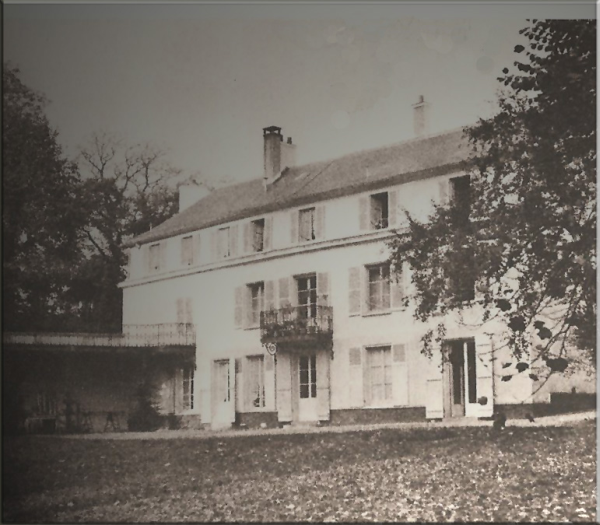 Despite being pregnant with their fourth child and it being a cold mid-winter day, she journeyed from her residence to join Charles at the village of Le Mesnil-sous-Jumièges. It was here that she suddenly became ill and died at the age of 28. While the cause of death was originally thought to be dysentery, in 2005 French forensic scientist Philippe Charlier examined her remains and determined that the cause of death was mercury poisoning, but offered no opinion about whether she was murdered. Agnès Sorel held great influence over the king and many historians believe that this made her many enemies, including the king’s son, the future king, Louis XI, and it could well be that she had been deliberately poisoned by her enemies. However this theory does not receive unanimous agreement as historians point out that, at that time, mercury was sometimes used in cosmetic preparations or to treat worms and that might have brought about her death. However there is another theory about the identification of the lady in the painting. 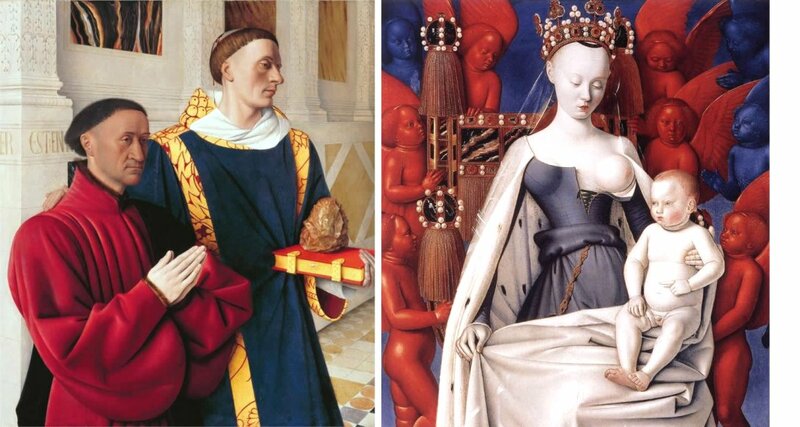 Jan Schafer in his 1994 book, Jean Fouquet an der Schwelle zur Renaissance, stated that he believed that the woman in the painting could have been Etienne Chevalier’s wife, Catherine Bude, over whose tomb the diptych was hung in Notre Dame, Melun. This right-hand panel depicts the Virgin and Child seated on a jewelled throne with its marble panels and adorned with large gold tassels. The Virgin and Child are surrounded by red and blue coloured cherubs and seraphims, which greatly contrast with the pale skin of the Virgin and child. The Madonna wears a blue dress, white mantle and a jewel-encrusted crown. Once again we have the colour combination of red, white and blue. The bodice of the dress is unlaced, giving us a view of her perfectly spherical left breast, which she has offered to the Child on her knee. She has the bulging shaved forehead which was fashionable at that time. Her facial and skin tone, as well as the body of the Infant Jesus, are of a pale grey-white colour, as if painted in grisaille (painted entirely in monochrome or near-monochrome). The colour Fouquet has used to depict her skin and the grey-blue colour he has used to depict her robe gives the Madonna a look of lethargy and sleepiness. The child ignores the proffered breast and instead looks at and points towards Chevalier and St Stephen. And so the two halves of the diptych were split up and never re-united. Well actually they were, for in 1904, France borrowed the panels from Berlin for an exhibition of French primitives. Was the Madonna based on Agnès Sorel or Catharine Bude? Did Agnès Sorel die of dysentery during the birth of her stillborn fourth child or was she murdered on the orders of Charles VII’s son, the future King Louis XI? Was there a third panel and in fact what we are seeing is two parts of a triptych? The third panel was rumoured to be depicting Etienne Chevalier’s wife Catharine. Besides Agnès Sorel being King Charles VII’s mistress was she also the mistress of Etienne Chevalier? I am sure you will agree that we have before us today two beautiful wood panel paintings and the story behind them is fascinating. For My Daily Art Display today I am going to look at an altarpiece by the fifteenth century Austrian painter and sculptor Michael Pacher. As far as I can remember, I have only presented one other altarpiece in my blog and that was way back on December 7th 2010 when I talked about the exquisite Isenheim Altarpiece crafted by Matthias Grünewald. Before I go into details of Pacher’s altarpiece let me talk in general about altarpieces. Altarpieces are normally carvings, sculptures or paintings or a combination of all three. They can be split into two main categories. One type is known as the reredos. It is this type which is positioned behind the altar, rising from ground level and acting as a backdrop to the altar. The other category is known as the retable, and these altarpieces stand either on the back of the altar itself or on a pedestal behind it. In some churches, one can see both types of altarpieces. The actual positioning of the altarpieces is often dictated by their size. In the early days, before the use of canvas was the norm for painting, altarpieces were usually constructed of two or more separate wooden panels on which a set of religious depictions would be painted. When the altarpiece comprised of just two panels, usually hinged together, it would be known as a diptych. If the altarpiece construction was made of three hinged panels, a central panel and two side panels, then it was known as a triptych. There were some altarpieces which consisted of many panels hinged together, side to side, but these side panels were also split horizontally giving small top and bottom independently hinged panels. These were known as polyptychs. 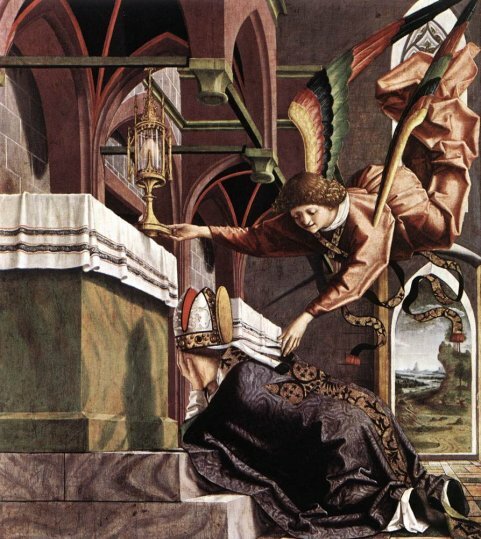 Today I want to concentrate on one particular altarpiece which Michael Pacher created for the Neustift Monastery high in the mountains close to Brixen, the south Tyrol town in northern Italy, known by the Italians as Bressanone. The altarpiece which is part painting and part sculpture is entitled The Altarpiece of the Church Fathers and Pacher completed it in 1483. Art historians have ranked this altarpiece as Pacher’s second most famous work, only being bested by the altarpiece he conjured up for the Church of St Wolfgang two years earlier. My reason for choosing the one I have is that I liked the various stories attributed to each of the panels. However before I look in detail at the altarpiece let me tell you a little bit about its creator. Michael Pacher, an Austrian by birth, was born around 1435 in or around the town of Brixen, which presently lies on the southern slopes of the Italian Alps, close to the border with Austria. Little is known about his upbringing or his early life except that he is thought to have trained under the Tyrolean artist, Hans Von Brubeck, who had a painting school in the area. Records show that Michael Pacher set up his own workshop in the town of Bruneck (Italian: Brunico) in the southern Tyrol region about 35 kms from Brixen. It was here that he fashioned his altarpieces. In the days of Michael Pacher, the town of Bruneck, which lies in the Puster Valley, was on a well used trade route between Augsburg in Germany and Venice and the small town became a stopping off for both merchants and their goods and with that, came affluence and fame for the small town. The town of Bruneck is now often referred to as Michael-Pacher-Stadt. Most of the work carried out by Michael Pacher was commissioned by the church and it was mainly his altarpieces which were in great demand. Pacher was not just a skilled painter but a master wood carver and his altarpieces often consisted of a beautifully carved figurative centrepiece flanked by religious paintings on the side panels. He spent most of his time in the area around Brixen and Bruneck although he did travel, on a couple of occasions, south to Mantua and Padua. It was when he was in his late fifties that he moved to Salzburg where he took on the large commission for the high altar of theFranziskanerkirche, the Franciscan church, but he was never to finish the commission, dying in Salzburg in 1498. Unfortunately what he did complete has not been preserved. Fortunately though , the statue of the Madonna with Child, one of Michael Pacher’s masterpieces, was integrated in the high altar designed two centuries later by Fischer von Erlach and has been preserved for posterity. And so to My Daily Art Display featured work, The Altarpiece of the Church Fathers. The picture shows the internal panels of the Altarpiece, the ones seen when the altarpiece is fully opened. It is a combination of carved shrines and wood panel paintings. The altarpiece is divided into a centre panel which consist of two separate works and two hinged side panels, which have paintings on both sides. Each panel depicts one of the four Great Doctors of the Western Church. Each of the depictions serve to remind us of a legend attached to the depicted saint. The Catholic Church bestowed the title Great Doctors of the Western Churchon saints whose writings the whole Church is held to have derived great advantage from and to whom “eminent learning” and “great sanctity” have been attributed by a proclamation of a pope or of an ecumenical council. 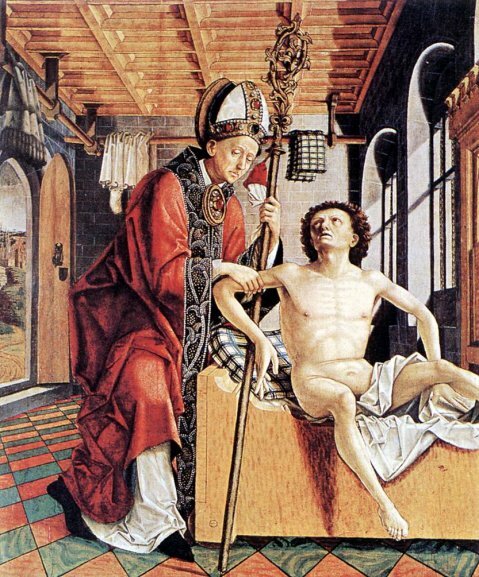 The four men we see on Michael Pacher’s altarpiece are Saint Ambrose, Saint Augustine, Saint Jerome and Pope Gregory I all of whom were the original Doctors of the Church and were named as such in 1298. They were early and influential theologians, eminent Christian teachers and great bishops and are known collectively as the Great Doctors of the Western Church. On the inner left side panel of the altarpiece we have Saint Jerome. Jerome of Stridonium, who was born around 347AD, is best known for the legend in which he drew a thorn from a lion’s paw, and in Michael Pacher’s depiction of the saint, we see him draped in the red robes of a cardinal, stroking the lion. Jerome was also a great scholar and was the translator of the Bible from Greek and Hebrew into Latin. Jerome’s edition of the Bible, the Vulgate, is still an important text of Catholicism. Jerome was a noted Christian apologist, a term given to people who present a rational basis for the Christian faith, and who defend the faith against objections, and by doing so attempt to expose the errors of other world views. The scene is the seashore, where there is a small pool, a little boy with a seashell, and a sandy beach on which St. Augustine, clad in his Episcopal robes, is walking, pondering with difficulty the mystery of the Most Holy Trinity. “Father, Son, Holy Spirit; three in one!” he muttered, shaking his head. Upon saying that, the boy, who was an angel according to legend, quickly disappeared, leaving Augustine alone with the mystery of the Most Holy Trinity. 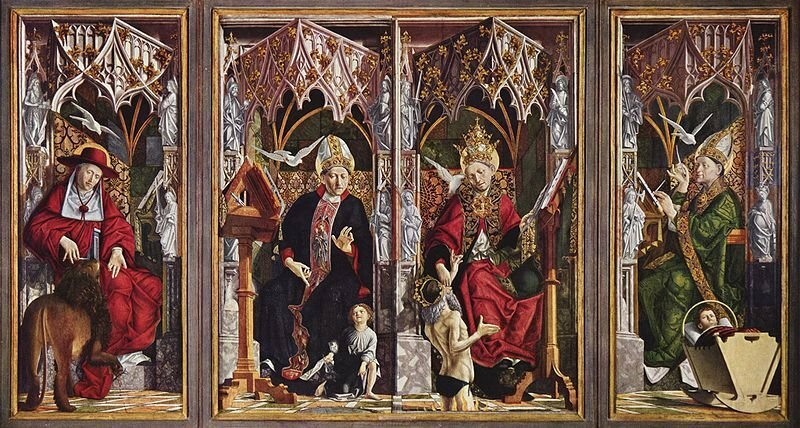 The right hand side of the central panel depicts Pope Gregory I. Saint Gregory, or Gregory the Great as he was known, was born around 540AD and was made pope in 590AD and held that high office until his death in 604. He was also known as Gregorius Dialogus (Gregory the Dialogist) because of his four-volume Dialogues, in which he wrote of the lives and miracles of the saints of Italy and of the afterlife. In the panel painting we see him seated in conversation with a man wearing a crown and who appears to be standing in the middle of a fire. So what is this all about? The legend surrounding Pope Gregory the Great, was that while he was walking through the Forum of Trajan, he thought of the justice of that emperor towards a poor widow deprived of her only son by a violent death. On entering St. Peter’s he prayed that the soul of so virtuous an emperor might not be forever lost, and his prayers were answered. The panel painting depicts Gregory rescuing the Roman Emperor Trajan from Purgatory by the power of prayer. The right hand side panel is of Aurelius Ambrosius, who would later be known as St. Ambrose of Milan, Ambrose, who was born around 330AD, was the bishop of Milan and who became one of the most influential ecclesiastical figures of the 4th century . In the side panel we see Ambrose sitting at writing desk but more interestingly at his feet is a baby in a cradle. Once again there is a reason for the baby’s inclusion and, like the other wood panel depictions, it is all about a legend, which is attributed to the main character in the painting. In this case it is a legend about Ambrose when he was a baby. Legend has it that a swarm of bees settled on Ambrose’s his face while he lay in his cradle, leaving behind a drop of honey. His father considered this a sign of his future eloquence and “honeyed tongued”. For this reason, bees and beehives often appear in depictions of St Ambrose. In each of the paintings the four Church Fathers are depicted with a dove, which symbolised the presence of the Holy Spirit so as to represent their holiness. All four are set inside beautifully decorated individual recesses, but appear to jut out from the picture plane into the viewer’s space. One gets a feel of deep perspective as we look at the altarpiece and this is due to the way Pacher has foreshortened the floor tiles and by the way in which he has given the four overhead canopies a feeling of depth which make them appear as they are jutting out towards us. On the reverse sides of the two wing panels there are two further paintings which can only be viewed when the altarpiece is closed. One of these depicts St Augustine liberating a prisoner whilst the other depicts the Vision of St Sigisbert. Today I am returning to an artist I first featured almost twenty months ago. The artist in question is Andrew Wyeth and in My Daily Art Display of January 3rd 2011 I looked at his famous work entitled Christina’s World. It is an extremely poignant painting and one which will always linger in my memory. I do recommend you go and have a look at it and see what you think. My featured painting today is a beautiful portrait which Andrew Wyeth completed in 1966 and is entitled Maga’s Daughter. The reason for the title will become apparent when you read the life story of Andrew and his wife Betsy. Andrew Wyeth was born in 1917 in the town of Chadds Ford, Delaware County Pennsylvania. His mother was Carolyn Brenneman Wyeth (née Bockius), a lady from Wilmington. His father was Newell Convers (N.C.)Wyeth, an artist and one of America’s greatest illustrators. N.C. Wyeth had moved from Massachusetts as a young man to study with the illustrator Howard Pyle in Chadds Ford and it was here in 1908 that he and Carolyn married. He then built his home and studio on an eighteen acre homestead close to the site of the Brandywine battlefield, where in 1777 the Continental army led by George Washington fought the British army in the American Revolutionary War. The couple went on to have three daughters and two sons of which, Andrew was the youngest. All the children were extremely talented. The eldest child, Henrietta is considered by many art scholars to be one of the great women painters of the 20th century. 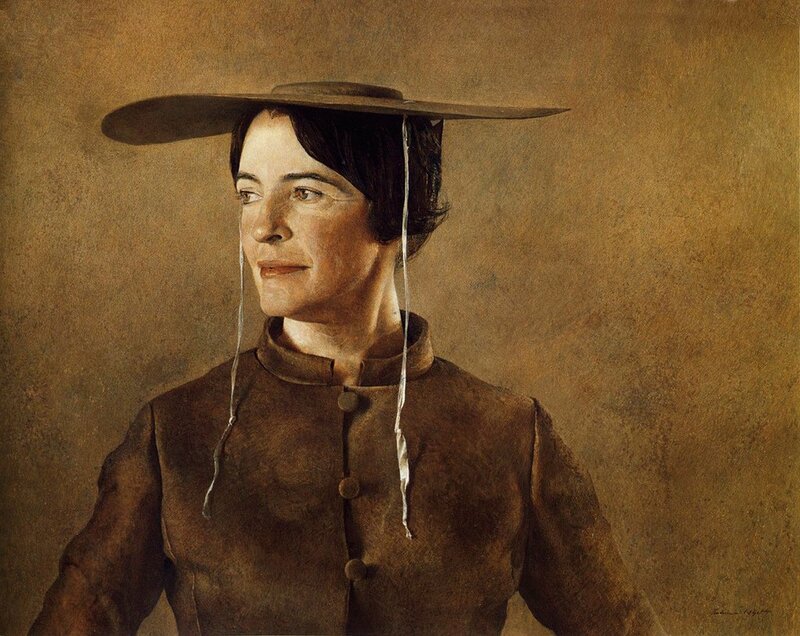 Carolyn Wyeth, the second daughter was also an artist whilst the youngest daughter, Ann, was a talented musician. Andrew Wyeth’s elder brother, Nathaniel, was a mechanical engineer and inventor. 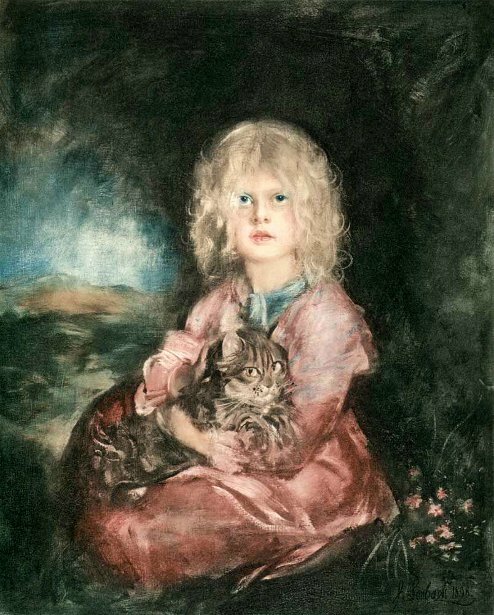 Before Andrew Wyeth had reached his teenage years his father had achieved celebrity status as an illustrator having illustrated Robert Louis Stevenson’s famous book, Treasure Island. Following on from this success he illustrated other famous novels such as James Fenimore Cooper’s Last of the Mohicans and Daniel Defoe’s Robinson Crusoe. Andrew Wyeth was taught art by his father, who inspired his son’s love of rural landscapes, sense of romance, and instilled in him a feeling for the Wyeth family artistic traditions. From an early age, the youngster soon began to enjoy drawing and with his father’s guidance, he quickly mastered figure study and watercolour techniques. Andrew soon became fascinated by art history and loved to look at works by not only the Renaissance Masters but native born American artists, such as Winslow Homer. In 1937, when he was twenty years of age, Andrew had his first one-man exhibition of watercolours at the Macbeth Gallery in New York City. It was a resounding success and all the works exhibited were sold. It was now that he was certain in his own mind that a career as an artist was all he wanted. This immediate success which he achieved did not reassure him as like many talented people he was exceedingly self-critical. He was irritated by some of his work believing it to be too facile. It was in 1939 that Andrew Wyeth met Betsy Merle James. Betsy James was born in the village of East Aurora in New York State in 1922. Her father, Merle James, a trained artist, worked as a printer for the newspaper, Buffalo Courier-Express. Her mother was Elizabeth “Maga” Browning (hence the title of today’s featured painting). Betsy grew up as the youngest of three girls. In the 1930’s the family spent their summers with their friends on Bird Point, a promontory jutting out into the Atlantic Ocean, close to the town of Cushing, Maine. The next door neighbours were Alvaro Olson, a blueberry farmer and his sister Christina . This was the Christina of Wyeth’s famous painting Christina’s World. As a young girl Betsy became great friends with Christina. 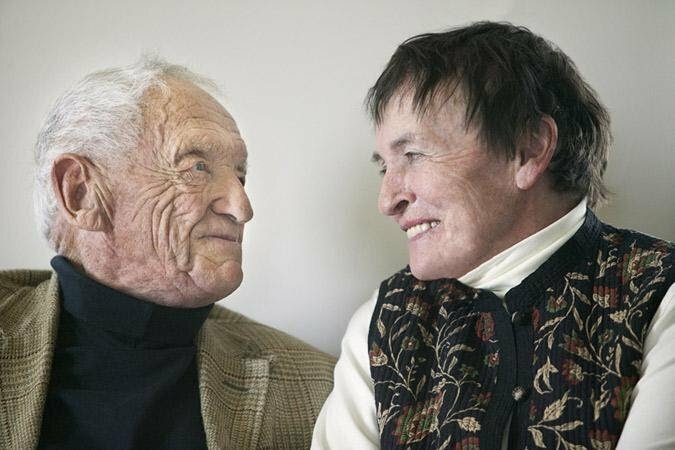 In 1939, on Andrew Wyeth’s twenty-second birthday, while spending the summer in Maine, the seventeen year old Betsy James and the twenty-two year old Andrew Wyeth met. At this initial meeting Betsy James took Andrew to Cushing to introduce him to her long-time friend Christina, who had been crippled by polio in childhood. Strangely, at this first meeting, it was not Christina who made the greatest impression on Andrew Wyeth but the weather-beaten, three-story, steep-roofed, clapboard house, built on a coastal promontory which was her home. However later Christina and Andrew became good friends and she featured in many of his paintings including three beautiful portraits entitled, Christina Olson (1947), Miss Olson (1952), and Anna Christina (1967). Christina even allowed him to convert one of the rooms in their farmhouse into a studio. In 1943 the couple had their first child, a son Nicholas. A second son, James followed three years later and would become a renowned artist in his own right. Eighteen years after the couple married and settled in to life in the school house, they moved and bought an old 18th century gristmill on the banks of the Brandywine River in Pennsylvania. Whilst her husband spent days on end painting, Betsy set about restoring the old mill, converting it into a home and a studio. The featured painting today is Maga’s Daughter by Andrew Wyeth, which he completed in 1966. It is a portrait of his beloved wife Betsy, whose mother was Elizabeth “Maga” James . She posed in a three-quarter view. She stands erect. Her bearing is one of dignified pride as she averts her eyes away from the viewer. Atop her head is an antique riding hat with its drawstrings dangling freely on either side of her face, almost if they were acting as a frame of a picture. She wears a drab-coloured, high collared dress which almost blends in with the slightly lighter coloured background. There is a faint flush of colour to her cheeks and a smile is forming on her lips. What beautiful eyes she has, lit by the unseen light source to the left of the painting. My blog today is the second part of the life of the French painter James Tissot. In my last offering I looked at one of his beautiful and unusual religious paintings and I told you a little about the life of the artist but purposely left out his relationship with the special lady in his life, which I wanted to save for today. In 1870 France was in turmoil. The Franco-Prussian war had broken out, which was the conflict between France, under Napoleon III and the Kingdom of Prussia and was the final straw in the conflict between the two nations. France was defeated and Paris was eventually occupied by the Prussian army. Tissot was a member of the Garde Nationale which was tasked with defending the French capital and later became a member of the Paris Commune, which was a quasi-government that briefly ruled Paris and acted as protectors of the Parisians and their property from March to May in 1871. However, Tissot, whether through business reasons or concerns he had for his personal safety, decided to leave his homeland and that year went to England where, through his art, he had built up a network of friends and business contacts. One of these was Thomas Gibson Bowles, the proprietor of the popular magazine Vanity Fair. Bowles not only provided Tissot with a place to stay in London but he also employed him as a caricaturist on the magazine. Whilst in London Tissot also exhibited at the Royal Academy. 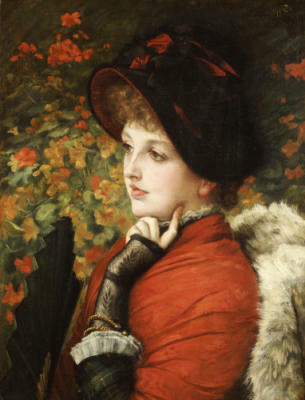 As was the case when he was in France, Tissot depicted in his paintings many of the chic ladies of London and he was a genius in the way he depicted them bedecked in the most expensive and sumptuous clothing which he carefully detailed. These paintings were very popular and soon, through their sales, he managed to buy his own house in St John’s Wood, which, at that time, had become a popular and much sort after enclave for artists. 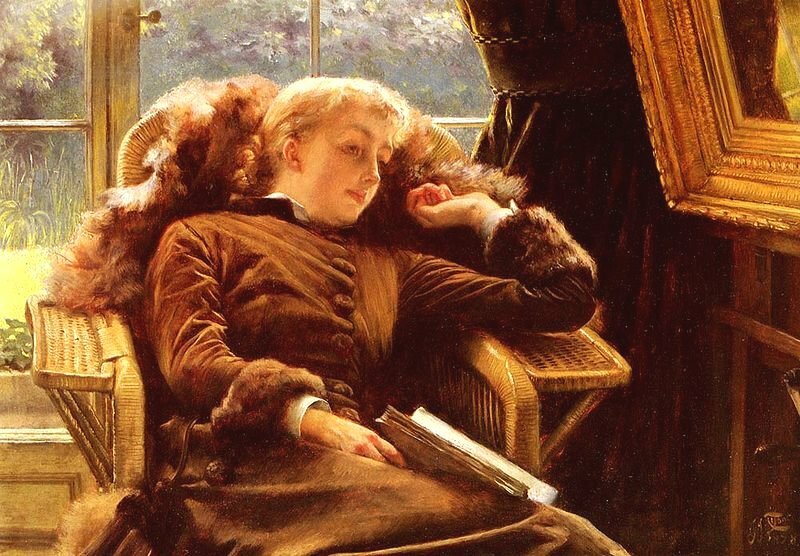 Tissot was not only admired as a great artist by the London Society but through the auspices of Thomas Bowles he was given entry into the social and artistic circles of London. This particular time, 1874, was the starting point for the French Impressionists and his friend Degas tried to persuade Tissot to exhibit at their first exhibition but he declined the offer. His decision to refuse to exhibit did not in any way cut him off from his Impressionist friends as he remained great friends with Berthe Morisot who visited him at his London home and also he remained very friendly with Edouard Manet. The following year, 1875, the two travelled to Venice on a painting trip. 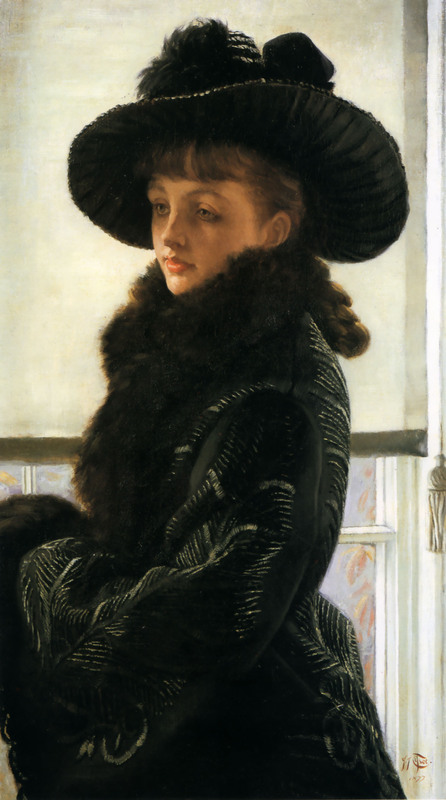 It was around 1875 that he first met Kathleen Newton, a stunningly beautiful divorcee and it was Tissot’s relationship with her that afforded him, as an adult, his only period of a real family life. She would dominate the subject matter of his paintings. Kathleen Irene Ashburnham Kelly was born in 1854 and brought up in Lahore and Agra. She was the youngest of five children and came from an Irish Catholic family. Her grandfather, Charles Kelly, left Ireland and practiced medicine in London. His son, and Mary’s father, Charles Frederick Kelly joined the East India Company and was stationed in Lahore where he worked as a clerk. He married Flora Boyd, whose family came from the North of Ireland, and the couple had five children, Charles (Charley), Frederick WD (Freddie), George Lloyd (George), Mary Pauline (Polly) and Kathleen Irene (Kate). In 1858, Charles Kelly, who had now added the family name “Ashburnham” to his own name, was transferred to Agra. Kathleen’s father finally achieved the rank of chief adjutant and accountant officer in Agra and eventually retired around 1865, left India and returned with his wife and daughters to live in London. When Kathleen was sixteen she travelled back to India to marry Isaac Newton, who was a surgeon attached to the Indian Civil Service. This was to be an arranged marriage orchestrated by her father and she had little or no input into the choosing of her future husband. During the sea passage to India she was befriended by a Captain Palliser of the Bengal Rifles regiment who was returning to the sub-continent to rejoin his regiment. (Other versions of her life state that Palliser, although a captain, was a naval officer). Their friendship grew during the long sea passage and they became lovers and despite his pleas to her to cancel her wedding plans, she and Isaac were married in January 1870. Being a devout Catholic, Kathleen decided to tell the local priest of her affair with Captain Palliser. For him to forgive her of her sins the priest told her she should first tell her husband about this relationship. She took the priests advice and told her husband who was horrified and as their marriage had not been consummated; her husband immediately instigated divorce proceedings on the grounds that his wife had not been a virgin on her marriage day. Kathleen returned to England, the sea passage being paid for by the lovestruck Captain Palliser, who accompanied her, as a gesture of good will for her agreeing to be his mistress. Their affair continued and she became pregnant but still refused to marry him. When she arrived back in England she went to stay with her father, who was at the time courting a widow. Kathleen’s daughter Muriel Mary Violet Newton was born there on 20 December 1871, which was also the same day as her Decree Nisi came through. Later Kathleen and her daughter Violet went to live with her sister Polly and her husband at Hill Road, St John’s Wood. It was about four years later around 1875, that James Tissot, who was also living in St John’s Wood, London, met Kathleen Newton née Kelly. The next step in their relationship came in March 1876 when Kathleen gave birth to a son, Cecil George Newton Ashburnham, who it is believed had been fathered by Tissot. Kathleen and James Tissot became lovers and she moved in with Tissot. (It should be noted that census records cast some doubt whether they lived together and it is thought that Kathleen’s two children spent most or all of their time living with their aunt Polly and her family). For Tissot, as was the case with Captain Pallister some five years earlier, he was smitten by this stunningly beautiful young woman. His terms of endearment for her were mavoureen (Irish Gaelic for my love) and his native French phrase ravissante Irlandaise (lovely Irish). Kathleen Newton became the love of Tissot’s life, his muse and adored lover. Tissot described his time with Kathleen as one of “domestic bliss” and the happiest times of his life. He completed many paintings featuring Kathleen of which I have featured some in my blog today. There was one great setback with his relationship with Kathleen for James Tissot. Although it was not uncommon for successful and wealthy men to keep a mistress they did not, like Tissot, parade them around openly and advertise their liaison. Tissot’s open and very public display of his affair with Kathleen shocked the London society which had once welcomed him with open arms and he had to choose between his social life and Kathleen. For Tissot there was no question as to which course of action he would choose. Kathleen was the love of his life and he chose her over life amongst London society. He and Kathleen settled down to a life of domesticity and were happy to mix with their many artistic friends who continued to support them. They never married and this may be due to their rigid Roman Catholic upbringing and beliefs. 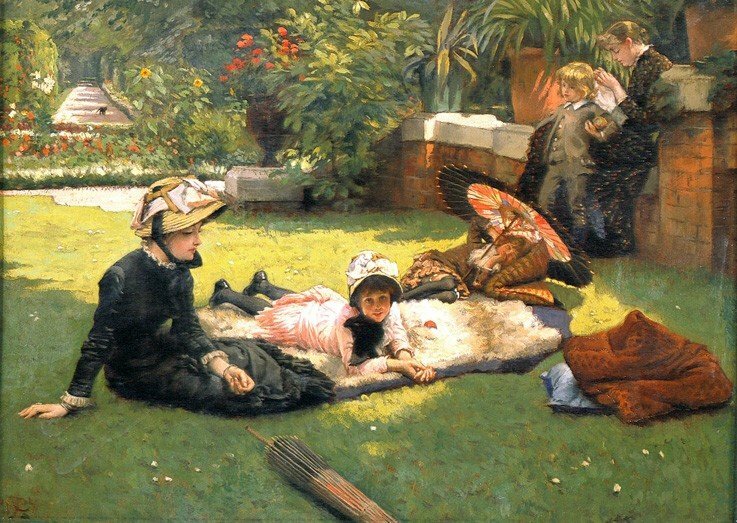 This charming painting shows Kathleen sitting on a rug in the garden next to her daughter Violet. The other small girl holding the parasol is her niece, Lillian Hervey. 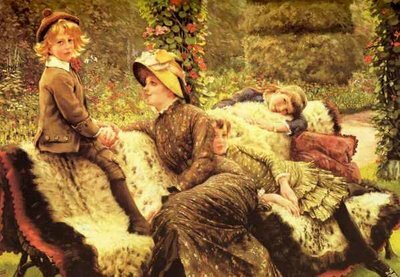 Sitting on the wall is her sister, Mary Hervey (Polly), who you can see ruffling the hair of Cecil George Newton who is thought to be the son of James Tissot. In the late 1870s Kathleen’s health started to deteriorate with the onset of tuberculosis. Tissot remained devoted to her. In 1882, Kathleen’s health declined rapidly with the onset of consumption. The illness gave her great pain and Tissot was visibly distraught by the physical state of his wife and her sufferings. Kathleen was aware that she was dying and she was saddened to witness how heartbroken her husband was, witnessing her long lingering death and so in November 1882, aged just twenty eight, she took an overdose of laudanum and died. Sadly because she had committed suicide she was not able to be buried in consecrated ground. The painting above shows Kathleen Newton and her children, Cecil George and Violet and her niece, Lilian Hervey, the daughter of her sister Polly. 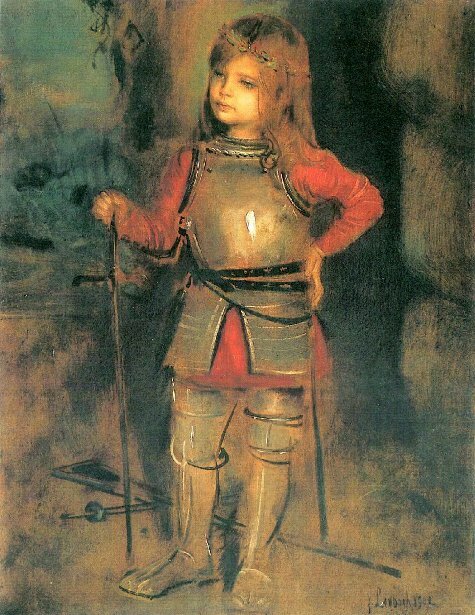 Although Tissot exhibited the painting, he would not sell it and kept it with him as a memorial until his death. One week after Kathleen’s death, Tissot left his London home at St John’s Wood, and never returned to it. The house was later bought by the artist Alma-Tadema. Tissot was inconsolable and never really recovered from Kathleen’s death. Tissot never married and like many people who are devastated by the loss of a loved one he turned to Spiritualism, and on a number of occasions tried to contact his beloved Kathleen. This somewhat sad story about a French artist and his fallen women is one of the great 19th century English love stories. My interest in James Tissot was born out of a comment I received from Lucy Paquette who said she was publishing an eBook this autumn, entitled Hammock, a novel based on the life of James Tissot. I hope, like me, you will be looking out for this publication. Patricia O’Reilly has also written a novel about Kathleen Newton entitled A Type of Beauty: The Story of Kathleen Newton (1854-1882) which I am hoping to buy as novels based on lives of artists or one of their paintings always fascinate me. My blog today is the first of a two part look at the life and art work of Jacques-Joseph Tissot, later to be known as James Tissot. In this first part I will look at his life and a religious painting with a difference, which was one of a series he completed between 1886 and 1894. In my next blog I will introduce you to the “love of his life”, who featured in a number of his later works. His early family life would later have a bearing on some of his paintings such as his beautifully crafted depictions of ships which he would have seen in the local harbour of Nantes and his devout religious upbringing would have given him an interest in religious paintings. By the time he was seventeen years of age, Tissot had decided to become an artist, much to the annoyance of his father, who had hoped his son would follow in his footsteps and run the family business. His father eventually relented and in 1855, aged 19, Tissot went to Paris, lodging with an artist friend of his mother, Jules-Élie Delaunay. He then worked in the studios of the French academic painters, Jean-Hippolyte Flandrin and Louis Lamothe who had learnt their trade as pupils of Ingres. During his stay in Paris, he would, like many aspiring artists, spend a great deal of time at the Louvre copying the works of the Old Masters and it was around this time that he met other contemporary artists such Degas, who also had once studied under Lamothe, the American artist, James McNeill Whistler and Édouard Manet. Four years after arriving in Paris, Tissot exhibited five of his works at the 1859 Paris Salon. Within a relatively short time he became an admired painter and received a number of commissions for wealthy patrons. There was also a change in Tissot’s painting style from his medieval-styled works to everyday life seen through his portraiture. He would depict modern Parisian women as they went about the city and its suburbs and he would spend time perfecting the way he depicted their style of dress, and such an interest in this aspect probably harked back to the days spent with his family clothing business and admiring his mother’s talents as a designer. 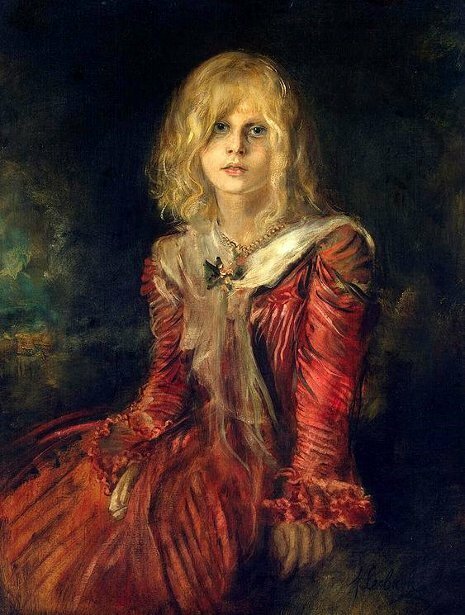 Much later in his life, in 1885, there was a major exhibition of his work at the Galerie Sedelmeyer, Paris, where he showed 15 large paintings in a series called La Femme à Paris. These paintings represented different types and classes of women, shown in their professional and social contexts. Tissot travelled to the Holy Land and this marked the beginning of a 10-year campaign to illustrate the New Testament. He would return to Palestine and back to Jerusalem and the surrounding area in 1888 and 1889 to make further studies of the landscape and the people. The culmination of the project resulted in his The Life of Christ collection which was a compilation of 350 watercolours that depicted detailed scenes from the New Testament, from before the birth of Jesus through to the Resurrection, in a chronological narrative. Two hundred and seventy of them were exhibited at the Paris Salon of 1894. It is reported that these works of art caused a sensation. Men were described as reverently doffing their hats whilst women wept and knelt before the pictures. Some women even crawled like penitents through the show. The exhibition of his biblical works moved to London in 1896 and New York at the end of 1898 before the entire collection was purchased by the Brooklyn Museum in 1900. In 1897 a French version of the profusely illustrated Tissot Bible was published and a year later an English version was available. This further enhanced the artistic reputation of Tissot and made him very wealthy. In the last few years of his life, Tissot worked on paintings depicting scenes from the Old Testament, eighty of which were exhibited in Paris. He had, by this time, retired to Château de Buillon, the residence he inherited on the death of his father. Tissot was never to complete the series of Old Testament works as he died at his chateau in Doubs, France in 1902, aged 66. My featured painting today is one of the biblical scenes from the New Testament completed by James Tissot during the period 1886-1894. It is an opaque watercolour over graphite on gray-green woven paper entitled What Our Lord Saw from the Cross. It is regarded as one of the most memorable of the series of biblical images by the French painter. It is totally different from the normal crucifixion scene paintings when, in almost all cases, we look up at the figure of Christ hanging from the cross. In Tissot’s painting, we are the eyes of Christ and it us who looks down from the cross at the people below. By doing this Tissot has allowed us to imagine ourselves in Christ’s place and by doing so we are able to empathise with him and maybe we can imagine what was going through his mind as he looked down upon friends, who had come to lend their support, and his enemies who have participated in his death and had come to gloat at his predicament. The men on horseback in the right mid ground of the painting are Jewish scribes. They have a look of satisfaction on their faces for Christ was their rival. These were the very men who had put pressure on Pilate to have Christ crucified. Their plan had succeeded and their rival had been removed. 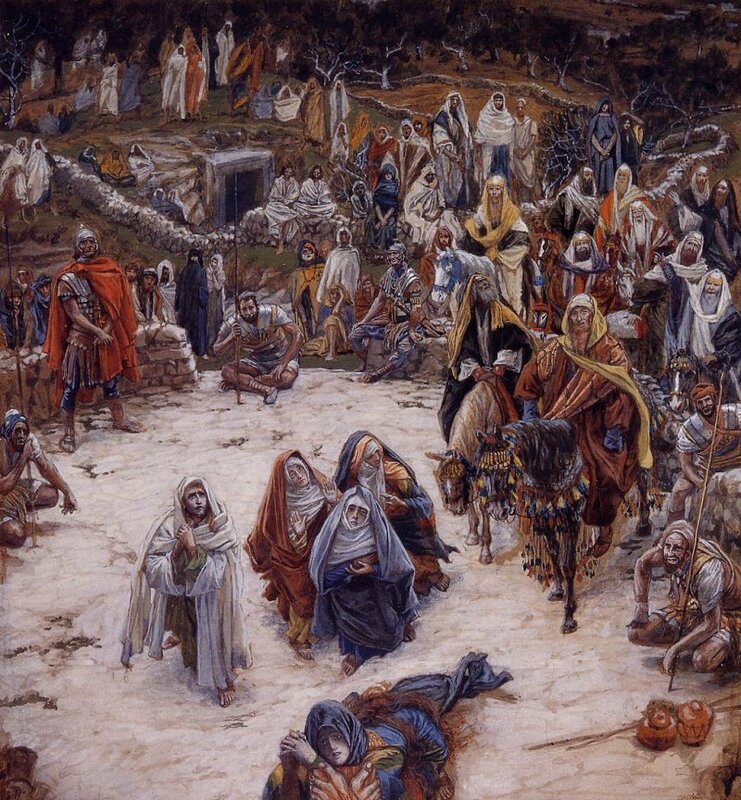 Look towards the centre of the background and one can see that Tissot has depicted the entrance to a tomb, the very place in which the body of Christ will be laid to rest after he has been brought down from the cross. This is truly a remarkable work of art and I would love to go to the Brooklyn Museum to see the complete series. In my next blog I will tell you about Tissot’s beloved Kathleen Newton, an Irish divorcee, and look at some of his portraits of this woman, who was the love of his life. My recent blogs have in some ways been connected. I will be in the middle of researching one artist when I come across another, who I feel I just cannot ignore and so my next featured artist has already been decided upon before I have completed my research on the current one. A few blogs back I looked at the life of Frida Kahlo. Whilst looking at literature concerning her and other female artists I came across Gabriele Münter and from her I focused on her one-time lover Wassily Kandinsky. On looking at his life I found that one of his early art tutors was Franz von Stuck and he was the subject of my last blog. I had decided to stop this train of thought when choosing a new artist but then during my research on von Stuck I stumbled across a contemporary of his, Franz von Lenbach and although I had decided to stop this system of choosing artists I found his portraiture awesome, especially his depiction of his own family. 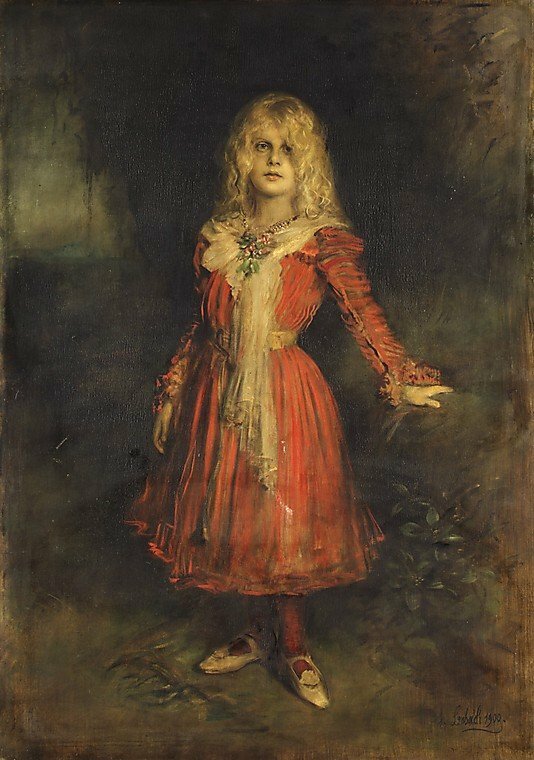 I just could not pass up the chance of introducing this German painter to you and share with you some of his wonderful family portraiture. Franz Lenbach or to give him his full title, after ennoblement, Franz-Seraph Ritter von Lenbach was born in 1836 in the small town of Schrobenhausen which lies about forty miles north of Munich. His father was a master builder and stonemason. Initially Franz had planned to follow in his father’s footsteps and become a master builder himself and accordingly in his early teens, he enrolled at the Landshut Technical College to study the art of stone masonry and architecture. At the age of fifteen he began to concentrate on sculpture and started to work in the studios of the German sculptor, Anselm Sickinger. If it had not been for his elder brother, Karl August Lenbach, who was a painter, then maybe Franz would have carried on in his father’s profession. However his brother introduced him to John Baptist Hofner, the German painter of animal and genre scenes and who had previously studied at the Akademie der Bildenden Künsten in Munich and it was he who introduced Franz Lenbach to drawing and painting. Hofner and Franz Lenbach would often spend time going off together on painting trips and Hofner taught Lenbach the skills of en plein air painting. For Franz Lenbach to gain admission to the Akademie der Bildenden Künsten he needed some formal groundwork training in art and so, in 1852, at the age of sixteen, he enrolled at the Polytechnische Schule in Augsburg, following which he trained in the studio of Albert Gräfle, the Munich portraitist. Finally Franz enrolled at the Munich Academy of Fine Arts in 1854. Three years later he was studying under the great German historical painter Karl Theodore Piloty. From the sale of one of Lenbach’s works, Peasants Trying to Take Shelter from a Thunderstorm in a Chapel and a scholarship, he managed to accumulate enough funds to go Rome with Piloty and Piloty’s brother Ferdinand, who was also an artist. So impressed was Theodor Piloty with the artistic talents of Lenbach that in 1860, he put Lenbach’s name forward for the post of professorship of the Kunstschule in Weimar, which had just been opened. Lenbach took the position and remained there for two years but by the end of this tenure he realised that life in academia as an art professor was not for him. It was around this time that Franz Lenbach met Adolf Friedrich, Graf von Schack, who was a German poet, historian of literature and an avid art collector. Schack had wanted to build up a formidable art collection for himself and although extremely wealthy he could not afford to buy paintings by the Old Italian Masters so he approached Lenbach and other aspiring young artists to set about copying some of his favourites. Once Lenbach agreed to carry out this commission he was sent to Rome to start copying some of the famous works. Here he met some other artists, such as Arnold Böcklin and Anselm Feuerbach who had also been commissioned as copyists by Schack. So pleased was Schack with what Lenbach produced he sent him to Florence in 1865 to carry on the good work. Whilst working in Florence Lenbach met Karl Eduard Baron von Liphart, a central figure of the German expatriate art colony in Florence, and it was through him that Lenbach picked up some lucrative portraiture commissions. From Florence he travelled to Spain in 1867 with Ernst von Liphart the son of his benefactor. The following year he and Liphart along with his patron, von Schack went to Tangiers. When he returned from North Africa he moved to Vienna and began to concentrate on his portraiture work. Many famous people sat for Lenbach including Richard Wagner, Emperor Franz Joseph I, Ludwig I, King of Bavaria, Emperor Wilhelm I and he completed almost a hundred portraits of Otto Fürst Bismark. It was during this period that Lenbach became recognised as the most famous contemporary German portrait painter. In 1882 Franz Lenbach was ennobled, and became known as Franz von Lenbach. 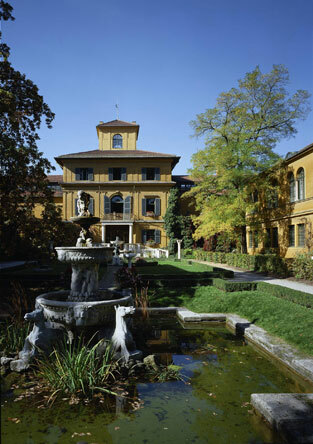 Four years later in 1886 he procured himself an estate in Munich and with the assistance of his friend Gabriel von Seidl, the German architect, he designed and had built a Florentine villa which took almost four years to complete. The city of Munich acquired the building in 1924, and today, the Lenbachhaus houses the city’s gallery. In 1900 he won the Grand Prix for painting in Paris. Lenbach died in Munich on May 6, 1904, aged 67. My featured paintings today are not the ones Lenbach did of famous politicians and rulers of various countries but the intimate portraits of his family. Lenbach had married twice and had three daughters, Marion, Erica and Gabriele. 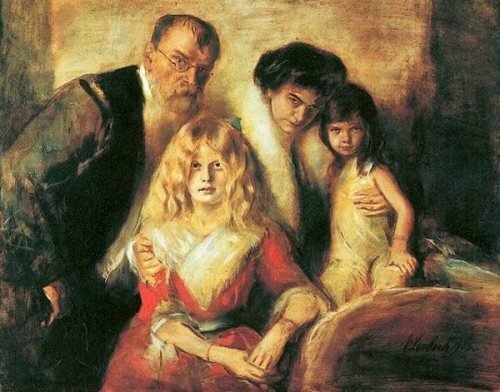 His daughters and his second wife, Charlotte (Lolo) Freiin von Hornstein appear as models in many of his paintings and it some of these beautiful portraits that I have included in today’s blog.